Another example of the fun to be had with scraps! 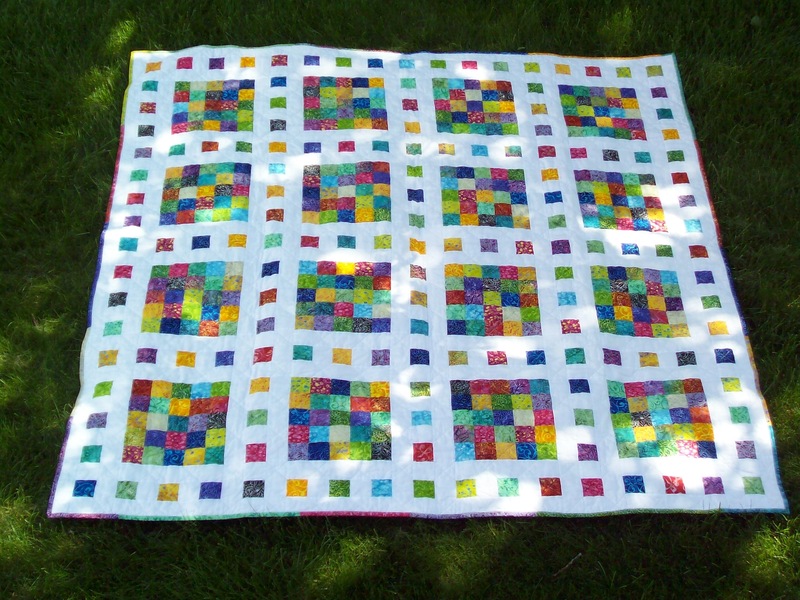 2-1/2″ squares are one of my standard scrap cuts. By regularly cutting scrap a little at a time, I always have materials ready when inspiration strikes. Of course, you can cut a lot all at once, or start with any precut 2-1/2″ strips you might have lying around. Either way, remember that all those little colored pieces add up to over 3-1/2 yards of fabric. Aren’t you thrifty?! A big pile of 2-1/2″ squares! (841, to be exact). You could also use 54 2-1/2″ strips by WOF or about 1-1/2 standard jelly rolls. Use up those leftovers. This is only a LITTLE pile, about enough to make one block. 4 yards background fabric. I used white, but wouldn’t this look marvelously modern-Amish with black?! 6-8 yards backing fabric, depending on how you like to piece backs. Or, three yards wide backing fabric. NOTE: Standard 1/4″ quilting seam allowance used throughout. 1. 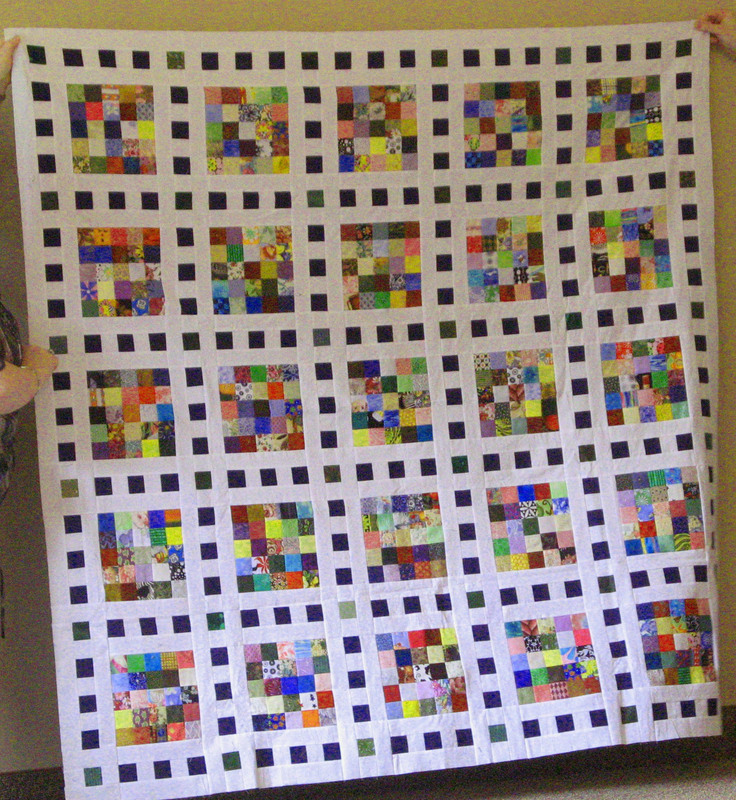 Piece colored 2-1/2″ squares into patches 5 squares wide by 5 squares high, also known as a 25-patch. I like to iron each strip of five as I go, then lay them out with the seam allowances nesting into one another. That creates a nice flat block with I iron and makes the piecing look good. Make 25 of these. 2. Cut 120 2-1/2″ squares from your background fabric. Also cut 120 rectangles 2-1/2″ x 10-1/2″ from the background fabric. 3. Create the center of your sashing by piecing strips that alternate three colored squares and two background squares. The pieced strips should be 10-1/2″ long when finished. Make 60 of these. PRESSING NOTE: I pressed all seam allowances towards the colored squares here. A little extra effort, but worth it. 4. Add the solid background rectangles to each pieced strip of five. One to each side. You will have a unit 6-1/2″ wide and 10-1/2″ long with a solid rectangle, a pieced strip and a solid rectangle. Do this 60 times. PRESSING NOTE: If you press the seams to the outside, meaning towards the rectangles, it will make final assembly easier. 5. Now it is time to create your setting cornerstones. Cut 288 2-1/2″ squares from your background fabric. Create 9-patches using 8 background squares and 1 colored square in the center. Do this 36 times. NOTE: Alternately, you can use 2 rectangles 2-1/2″ x 6-1/2″ for the top and bottom of the “9-patch” and 2 2-1/2″ background squares and one colored squares for the center piece. Adjust cutting accordingly. PRESSING NOTE: Ignore the picture of the block below. This one is NOT pressed the best way. The best way is to press all seams towards the middle, in other words, towards the colored block. This will make the block nest nicely with the sashing rectangles when you start assembly. I took this picture before I thought this through. 6. Lay out the quilt! (I love this part.) Use the picture of the finished quilt as a guide. You will assemble it a row at a time. There will be 6 “rows” that are all sashing and 5 “rows” that alternate sashing pieces and 25-patch blocks. 7. Press everything. No this isn’t my favorite step either, but it makes it look great and the quilter (you or someone else) will thank you. Create your backing and binding. Sandwich, quilt and bind. Ta-dah! You have a finished quilt. I hope you enjoy Film at Five. Please let me know how it goes for you and share your finished projects. I will add them to the gallery to inspire others. 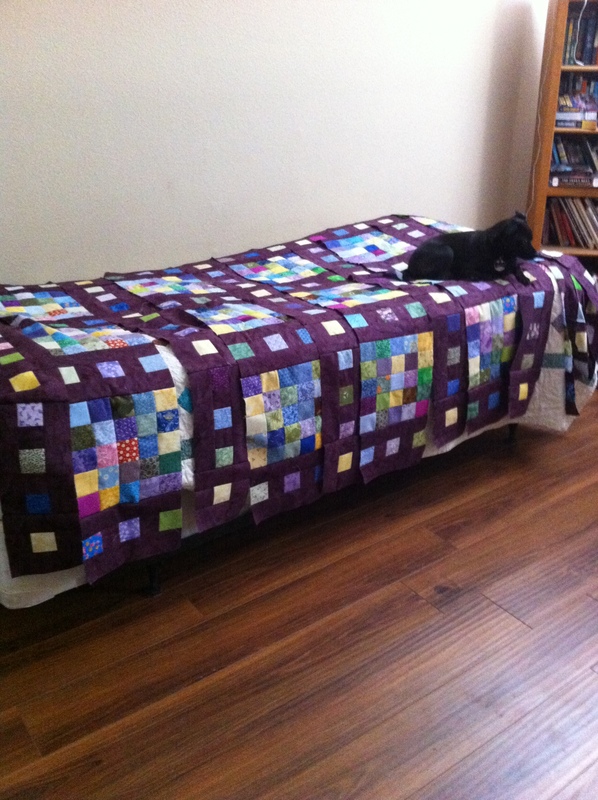 Marcia used a lot of “old, ugly” scraps to build this lovely quilt. How did that work? 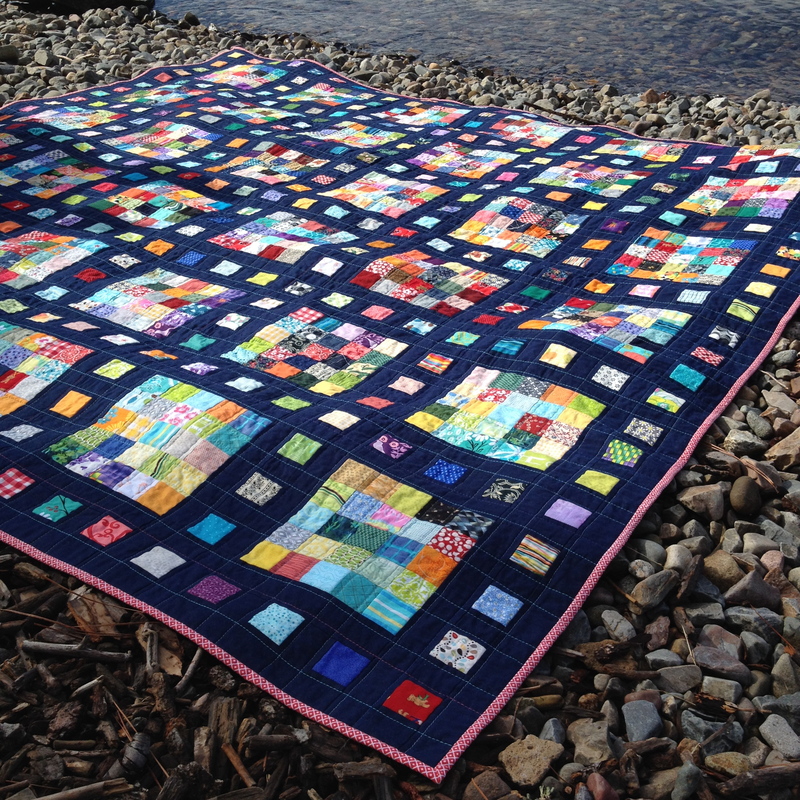 Beatrice created this beauty for a guild project–LOVE the quilting. And Bianca, who made one for her friend. And Linda, who is also fond of dark sashing. Debbie in Northern Alberta says, ” I picked up my box of 2″ pre-cut scraps. I remembered this project as a someday thing and started sewing. Before I knew it….I had all of the blocks completed. I have never sewn so fast in my life. It really helps that all of my pieces were already cut. lol I went with the 2″ instead of the 2.5″ as I had more of them in the smaller size. I also used just navy blue in the sashings and various greens in the corners for some continuity. I love the results.” Wow! Debbie. I love it, too. Jennifer has gone completely wild and created three–so far! The first was this lovely variation, followed by two for her daughters. Sandra in Switzerland made a very scrappy-happy version. Judy made hers with a light grey background and meander quilting. Jane’s quilt got to travel to the beach at Lake Pend, Oreille, Idaho during her camping trip where she finished stitching down the binding. This was a wedding gift. Lucky couple! Here is Lynn’s beautifully quilted version. Yvonne was lured in and her Film at Five is still growing! Martha made hers baby sized. 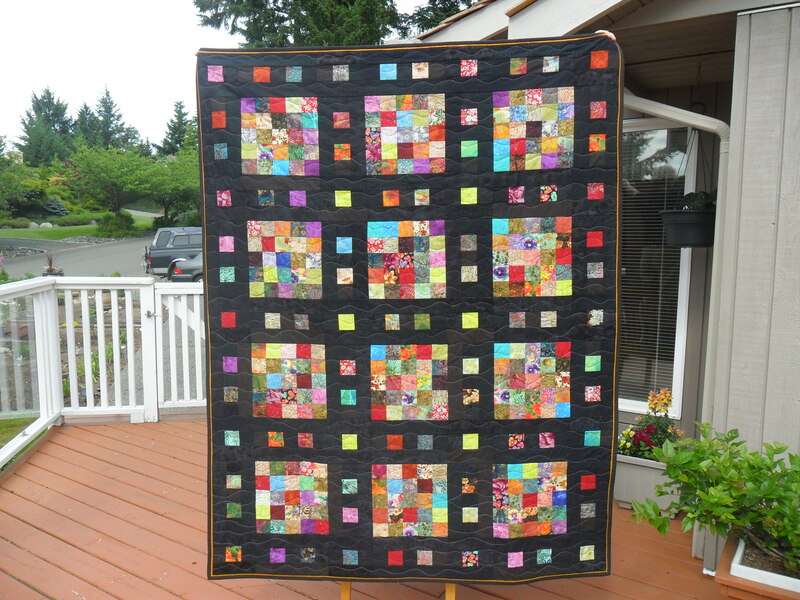 Posted on September 24, 2012 August 12, 2018 by weddingdressbluePosted in Quilts, TutorialsTagged quilt, sewing, tutorial. This is such a great idea. A beautiful finish! Love it! Book marked for future use. Thank you! I wish I could start it right this minute! Would love to make this a table topper size… adding to my list! Nice tutorial! Thank you for writing this tutorial up I lve the pattern and will be making it “one day”. 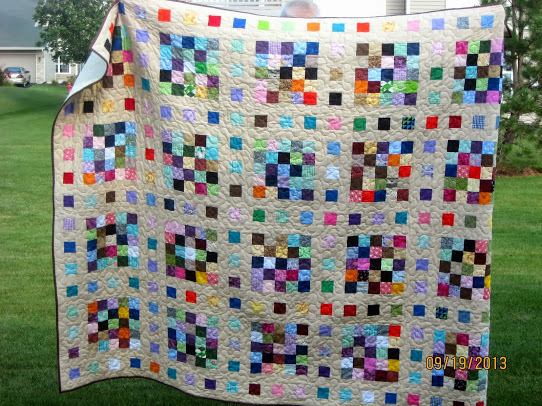 On my bucket list..as are many of your quilts! Thanks for sharing. I think I may have FINALLY found a home for all those “Y2K” squares I received so long ago!! Thanks for the great idea!!! Can’t get over all the fun you are having with those squares. I love the film strip sashing; perfect with the 5X 5 blocks. Fantastic quilt! Thank you very much for the instructions. This has definitely gone into my using up scraps pile with my 2.5in squares box. thanks soooo much for the share! That is great! Thanks for sharing. I swear as soon as I get caught up on all the gifts I am making I am going to sew some scrappy quilts. Love this one! Another stunning quilt. Thanks for the tute. If only I could get my glasses on my nose I would put this in the line after the 2 I have cut out to do while recuperating from my carcinoma removal and skin graft. Maybe in a week I will get to sew. What a great scrap buster! What a great quilt. Im going to get this one started for sure. You have some great ideas for us using these little treasures! Do you think this would look okay with the 2 inchers??? Norma… Just discovered your Film at Five Quilt! love it, wish I could start it now. Am working on hand quilting a Flower Blanket quilt which hope to finish by June! Thanks for the pattern! I saw a quilt like this at Sister’s Quilt Show, Oregon a few years ago. It was one I thought was interesting enough to make. Years later now, I like the scrappy version so much more. I like the 2.5″ size. Thanks. How would you do this with a jelly roll? If I were making Film at Five with a jelly roll, I would cut the entire roll into 2-1/2″ squares and start piecing. Or, you could sew together the strips in sets of five and then sub-cut them into 2-1/2″ sections. Those would then be mixed and re-pieced into blocks. Just one jelly roll won’t quite do the entire quilt, though. You can get about 670 2-1/2″ squares from a jelly roll and the quilt uses 841, so you will need to add some coordinating scraps. The 5×5 blocks could all be made with the jelly roll and the sashing with other fabrics, if you wanted. I hope this helps. Feel free to ask any other questions. Have fun making Film at Five. I would love to see your finish. Oh no, another wonderful quilt. Guess I will have to eat/excercise so I can live long enough to finish all the quilts. I received 2 of your scrap quilt books for Christmas – now I have another one to try! Thanks so much – I am already planning my colors. I just came across this and LOVE it! Thanks for the tutorial and I can’t wait to try one. Catching up on my reading, pattern searching after a Holiday of Sickness. I have bags of scraps….this surely will be fun to make. Thanks for your very nice and easy to understand tutorial. 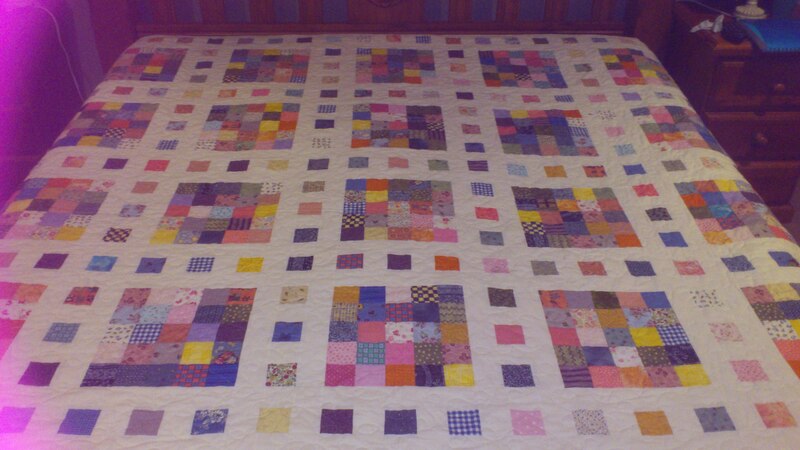 I am anxious to start cutting this w/e when I have my quilty g/fs over. Thanks for the tute! I have to make this quilt!!!!! How beautiful. I can tell you used your iron. Fanastic!!!!!! This one would be hard to give away. Maybe I need to make 3 of these. You did a wonderful job, to say a little. When I teach people to quilt, I tell them that if that won’t iron, to leave my classroom. A quilt must be ironed during the process. I do get people to stand up and leave. I hate to sound like a dummy, but what is a leader/ender block. I know what a leader/ender is and use them when strip piecing but I don’t know about this block. Could you explain or reference the post you introduced it in? I use the term leader/ender block for simple repetitive blocks that I work on using the leader/ender style of sewing. Nothing special. Thanks for asking. I have made several quilts this way. Currently I am making a 132 block scrappy thing and have about 100 blocks done. Thank you for the tutorial. 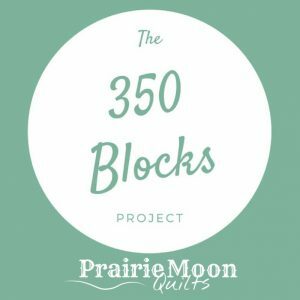 This project will be great for a Quilt for Comfort. I have already started cutting strips which will work perfectly for a Film and Five quilt. Saw this quilt and just had to make it, have all the components made and tomorrow will sew them together..have enjoyed the process! Thanks for great tutorial..look forward to more. My church group makes lap size quilts to give to those in time of need ie;SANDY and I try to adjust the pattern to meet that size, you don’t happen to have one already in the crib or lap size done.? Just asking because this quilt addresses the scrap usage and trying something new to keep us fresh. I love the way you teach, thank you . Love this quilt. I have a big bin of flannels to use up, do you think it would work with bigger squares (4″) and a 3 X 3 grid? Thanks so much for the scrappy pattern; A great idea to use up alll the small scraps. Thanks for the great pattern. I’ve made my first quilt and it is for me. 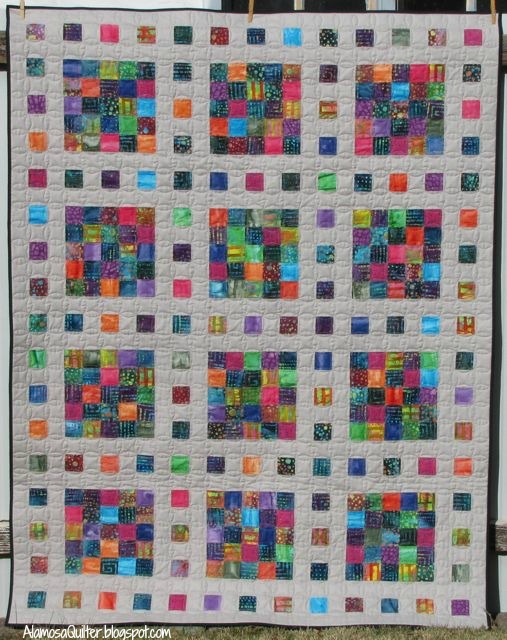 I am looking for a scrappy pattern for my quilt group to make. The members want to make a mystery scrappy over a few months next year. I would put one step in the newsletter each month and then we will have a final show and tell. Could I have your permission to use this pattern if I give you credit? I’m not sure about copyright etc and don’t want to infringe anything, as it’s a free pattern on the net does that mean it’s OK or would everyone have to log on and get the pattern themselves? If you could please email the answer to wyndhampatcworkers@hotmail.com I would be grateful. I think I love this pattern – I can only see “Lucie”s” version – for some reason the other pictures are not open. I just bought great jelly rolls that I think would look great with a black sashing! Love the quilts! Thank you for a great pattern and especially for the detailed pressing instructions. Can’t wait to try it! This is gorgeous! My first thought was to make the sashing in black-and-white, like film. 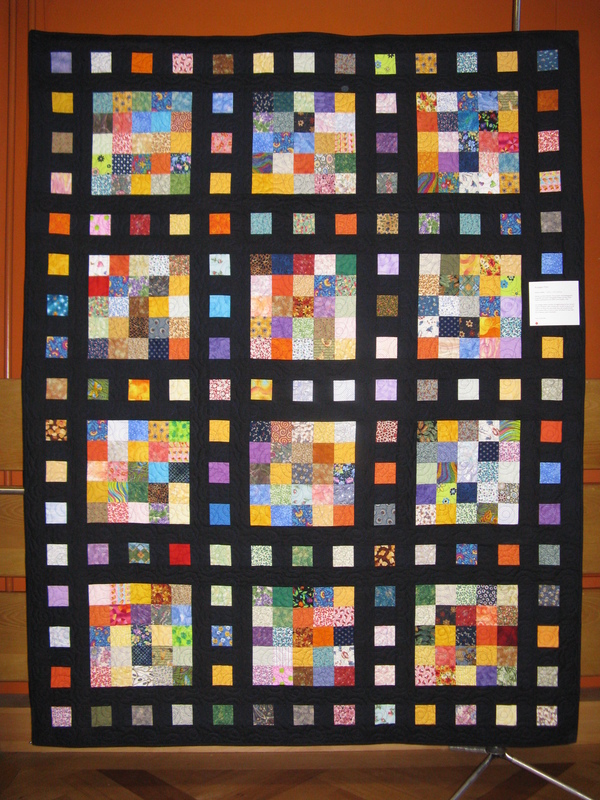 Then, as I saw the various quilts posted….I liked every variation! Great tutorial. I have some crazy squares already made that I might use for the large pieced blocks. 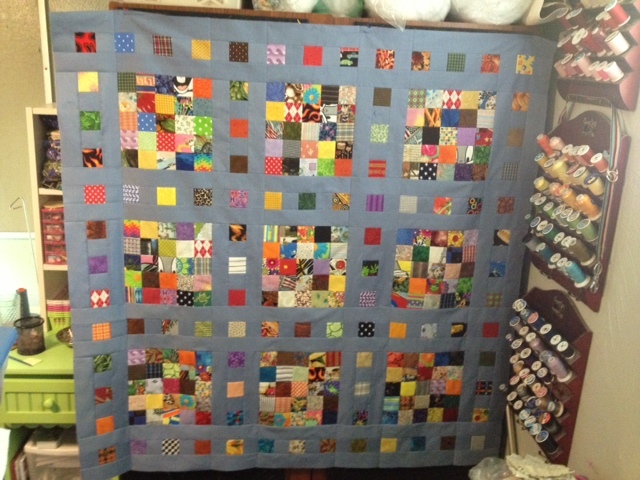 I might even use some “picture-fabrics” as the large square…….infinite possibilities! Sounds fun!!! Thank you! Fell in love with the Film at Five, and decided to hit my scrap pile and make a little dent in it! Turned out splendid! Thanks for the great tutorial. Love this! Think I’m going to make one. Not sure of what colour yet but, obviously got lots to chose from! Thanks Julie from Adelaide Australia. 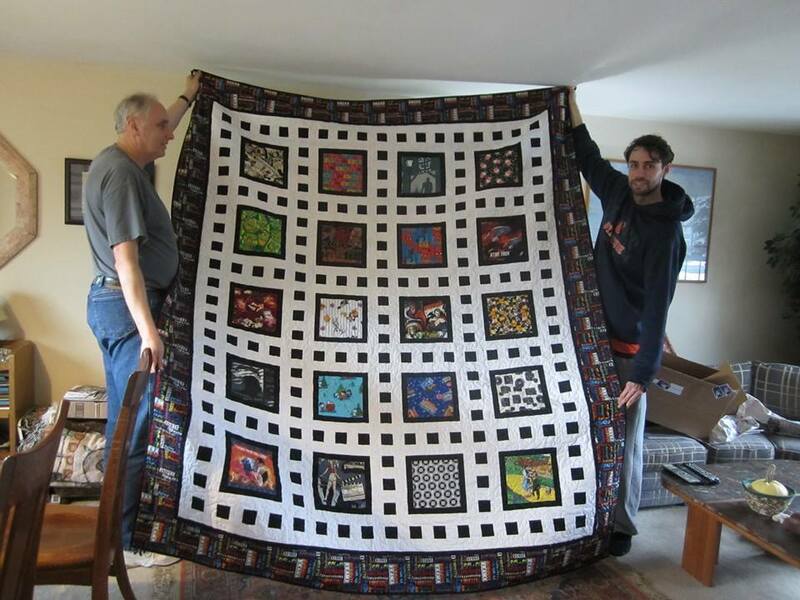 I love knowing that someone did one of these in all 2″ instead of 2 1/2″ squares! I was given a box of 2″ squares and was wondering what to do with them. I think I have found my answer!!! Thanks for sharing this tutorial! Wow! They all look so great. I love looking at different quilts made from the same pattern. Thank you for making the pattern available. I make quilts for donation from other people’s donated scraps so this quilt is definitely on my ‘some day’ lost. (I came in from a link on “Piecing it Together” newsletter published 18 Dec). What a wonderful selection of the quilt pattern.